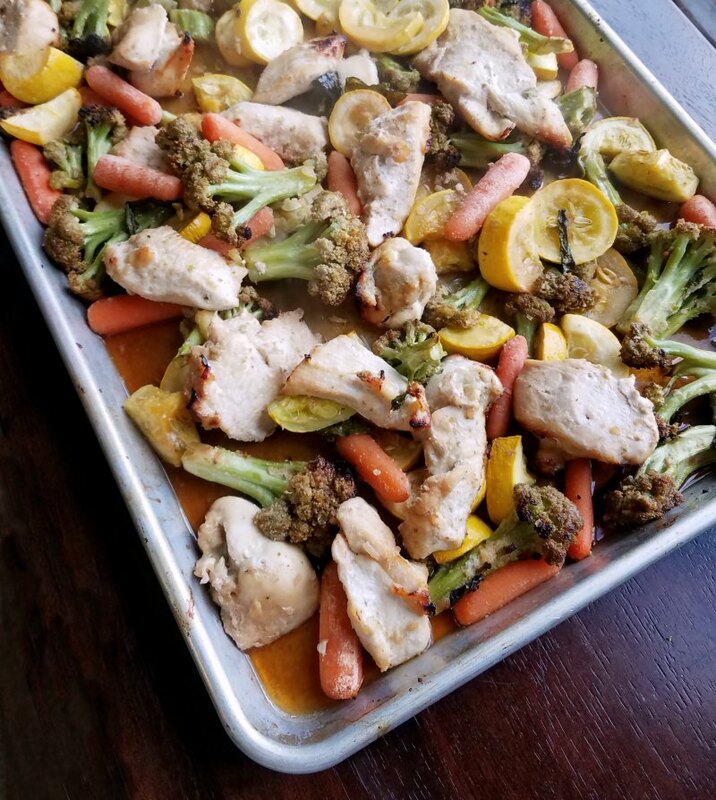 Garden fresh vegetables and chicken bathed in honey garlic goodness and cooked simply on a sheet pan. Get your rice cooking, dinner will be ready soon! When the garden starts producing, I love to come up with fun and simple dinners that are loaded with vegetables. 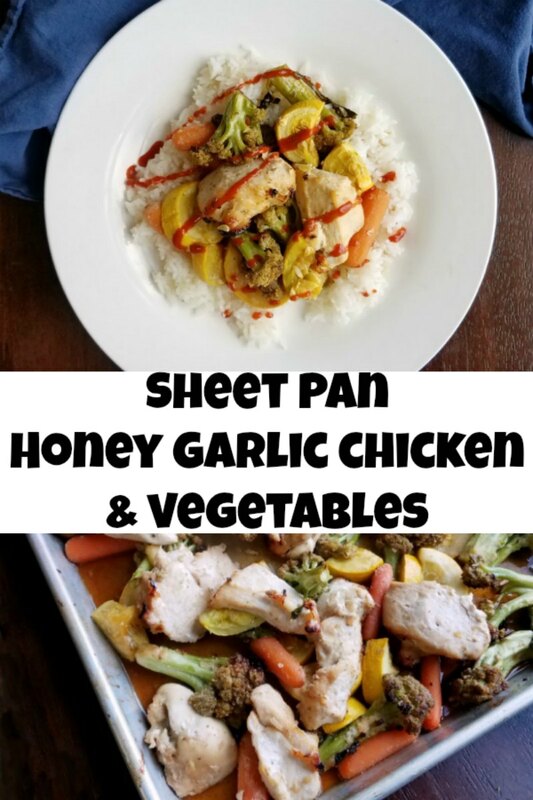 This sheet pan honey garlic chicken dinner is a great way turn a lot of those in season veggies into a stir fry style dinner. The best part is you don't even have to stand over the hot stove. This is a super simple dinner to make. Cutting up the vegetables is probably the biggest chore, and it's not like you need a fine dice so even that goes quickly. I like to marinate both the meat and veggies. That way everything is soaked in flavor before you even start cooking. 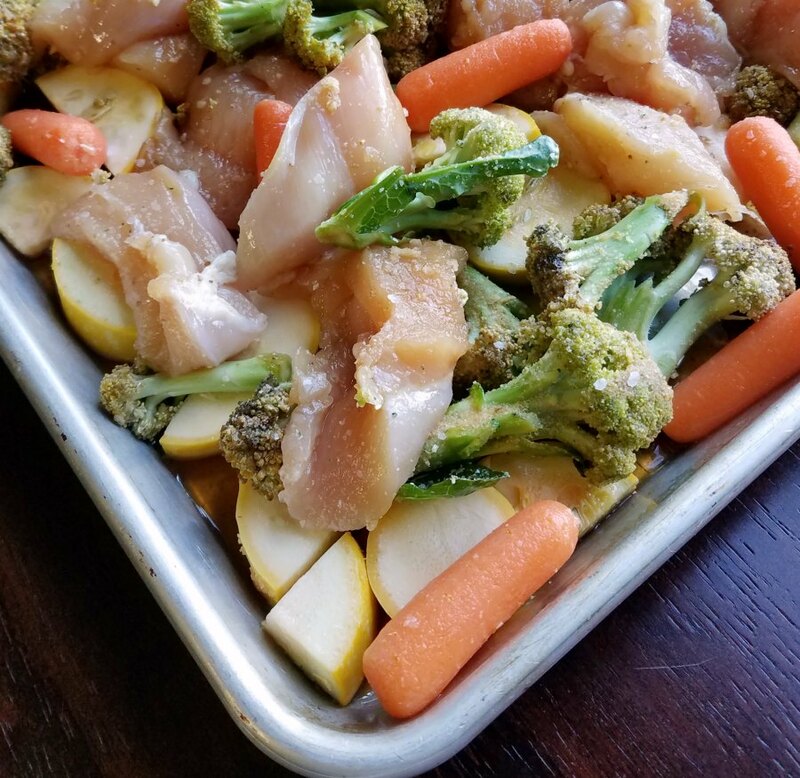 After a nice bath in flavor, just arrange it all on a greased sheet pan and let the oven do the work for you. Easy peasy! While the meal cooks, I cook some rice to serve with it. 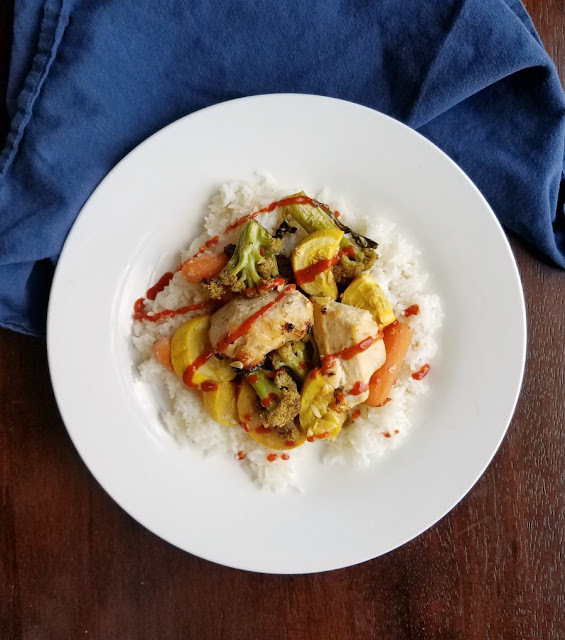 I've been loving using my instant pot for rice. It just takes one touch of a button and it's done. Plus it eliminates the little splatters of starchy water I always get when I do it on the stove. While everything cooks, kick your feet up for a minute. Go ahead, you deserve it! Long before you are ready for your break to be over, dinner will be done. It's nutritious and delicious too! I love how everything gets a light coating of flavor in this recipe but there's not an overpowering and gloppy sauce. Just enough to make it good. We like ours with a drizzle of sriracha. Little Dude of course prefers his without. What are your favorite sheet pan dinners that feature fresh veggies? Cut the chicken into medium sized chunks. Cut the broccoli into florets. Slice the squash. In a bowl, mix together the honey, soy sauce, garlic powder and oils. Season with a pinch of salt and pepper. Marinate the chicken and vegetables for at least a half hour and up to 4 hours if you have the time. Preheat the oven to 400 F and grease a half sheet pan. 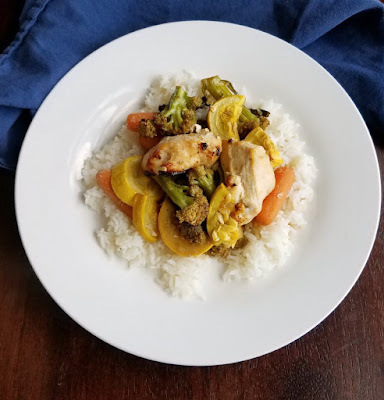 Arrange chicken and vegetables on pan. Cook for about 25 minutes, stirring half way through. Check chicken for doneness before serving over rice. Eek I am super excited to add another sheet pan recipe to my repertoire. I love them and I don't have very many so I know this honey garlic will go over GREAT!! Happy Fri-YAY!!!! I am always happy to have another sheet pan recipe too! We do love veggies and sheet pan recipes are the best! The marinade with the honey and soy sauce sounds delicious. Sheet pan suppers are such a great way to feel the family without a ton of work! The perfect dish to enjoy those summer veggies! I like that it's light on the sauce, but big on the flavor too!